Oh, the bliss of sinking my teeth into a warm, chewy chocolate chip cookie! Some secrets are made for sharing, and the secret ingredients of contentment are blessings to spice up a life well lived. Personally, I would love to simply order contentment like a favorite dessert. I state my order, and presto…a friendly waiter serves contentment, along with a tasty side of joy. With each bite, I unfold the warmth of contentment, letting go of all the concerns that stir up disappointment or restlessness in my ever-wanting heart. Through the heat of trials, we learn contentment is not dependent on happy circumstances. It is a stretch to digest this truth that I can experience contentment in good times and in bad. It’s not easy to swallow–this thinking does not slide down easily. 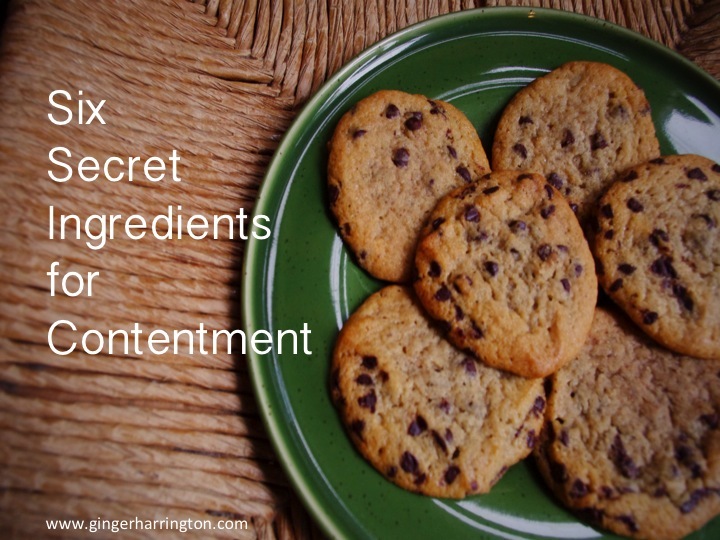 What are the secret ingredients for cooking up contentment? Be willing to learn. Contentment is something we learn—it doesn’t come naturally for any of us. We have to be willing to accept that life is full of a variety of experiences. Some days I just don’t want to accept life is not delivering what I requested. Learn to be strengthened in Christ by depending on Him rather than self. We try to talk ourselves into contentment—as if it were merely a matter of self-effort. If we just stir the heart a little harder… I can want it, but try as I might, I cannot will grumbling and discontent away. Understand the difference between needs and wants. How often I want to throw in my wish list of hopes and desires, craving to have it my way? Maybe we need a little strength to let go the insistence of our desires and simply place them in His hand with simple trust. Take God at His word, and get rid of the question. 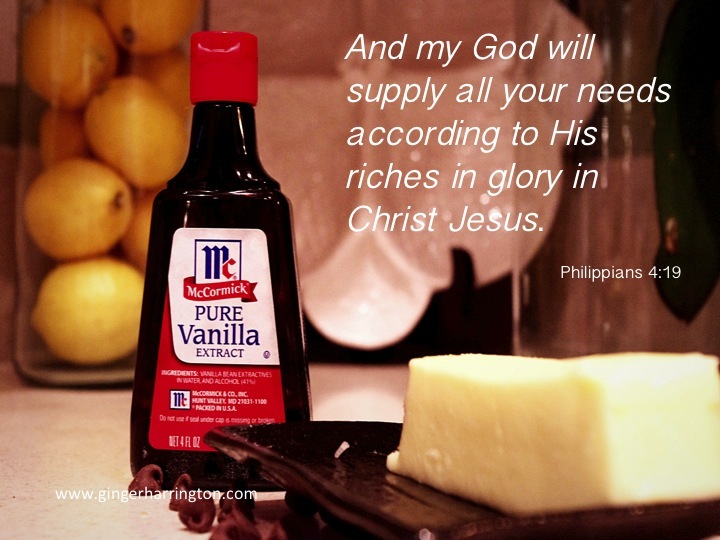 Choose to believe that God will supply all our needs in Christ. I act like this verse says God might supply…. Doubt reads this statement as a question, or a possibility, rather than a given. Doubt leaves us hungry for the substance of faith. 6. Recognize God’s provision when it comes. Ultimately, trusting God is the key ingredient of contentment—it is what makes the other ingredients create a perfect blend that is nourishing and sweet to the soul. Hi Ginger! Your post really got me to thinking (and that’s no mean trick). I used to (and sometimes still do) get frustrated by some of the issues our country faces today, but ultimately learned to turn it over to God while continuing to pray for change. That gives contentment. I do think that far too many Christians have mistaken contentment for comfort or apathy though. I agree with you. For most of us, contentment is a mixed bag. It is so easy to get pulled under the negative. I know I need those reminders to find contentment in the midst of things I wish I could change. Beautiful, Ginger! I’m with you. I tend to think maybe God will provide. I’m not so good at separating the wants from the needs either. I don’t NEED my kids’ room to be clean. That’s hard to admit. 🙂 I’m all about contentment, but I really hoped you’d give a recipe for those cookies using a secret ingredient!! You just had to bring up kid’s rooms! As the mom of three teenagers, I completely get where you are coming from. There are so many days when I struggle with frustration over the state of my house, and then I remember to grateful for all the mess an active family can create. As to the secret recipe for the cookies…I’ll give you the scoop. Panera Bread. I bought some cookies so I wouldn’t be tempted to blow my diet. A girl’s gotta know her limits of temptation, and cookies from scratch takes me right over the edge! I’ve been learning a lot about being content in this season of my life. I am realizing I still have a lot to learn. Welcome to 5 Minutes for Faith! Thanks for the welcome! I am pretty sure I’ll be needing contentment lessons years to come! 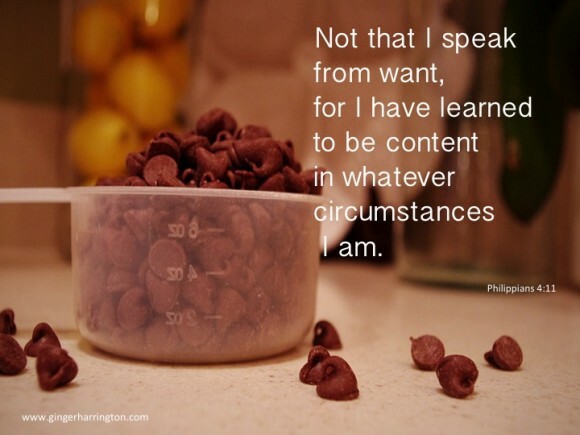 My greatest encouragement in learning to be content was realizing the great St. Paul also had to learn contentment. The first step for me was being willing to thank God for the smallest things.